Continuing the theme of meeting thoroughly lovely people, Geoff and I met up with Eric Innes yesterday. Eric paddled solo around Britain in 2009 and when he found out about our expedition he got in touch to offer his experience. So it was great to meet up with him in person yesterday. We first caught up on the beach at Blackpool, Eric took our lunch order and ran off to the shops so we didn’t need to stop long in case we lost the benefit of the tide. 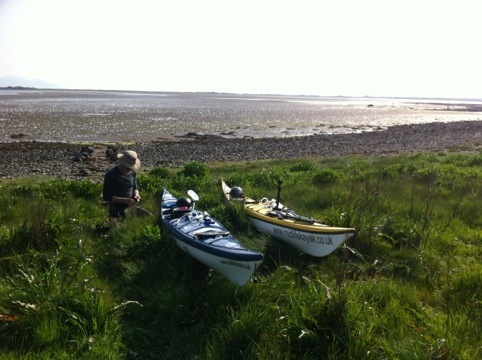 We then paddled down to Fleetwood to set us up nicely for crossing Morecombe Bay. Amazingly Eric was there waiting for us. He took us shopping and then joined us for a meal that we cooked at our bivvy. We shared paddling stories and a bottle of wine before getting our heads down. Eric thanks so much. Top bloke! Ok, to start with, an apology. We forgot to put the SPOT tracker on the other day so we have the impression that we had actually booked in to a static caravan park for a few days. Actually we’d crossed Liverpool Bay (21 miles) to Formby. It was a misty day and we didn’t see land until we were around 6 miles out so relying on my map reading skills and both our abilities to keep the kayaks on a bearing. Attached videos feature Tanya and Dawn (Tanya’s cousin). Last time I will see Tanya until we get to Newcastle. Thank you so much to Dawn, Roger and Ivy for coming to see us in Wales. Great to see you guys! As Geoff and I enjoyed the sunshine in Llanfairfechan waiting for the wind to die down so we could get around Great Orme’s Head, we has a chance meeting with Sonja Ezergailis from Coastal Spirit. 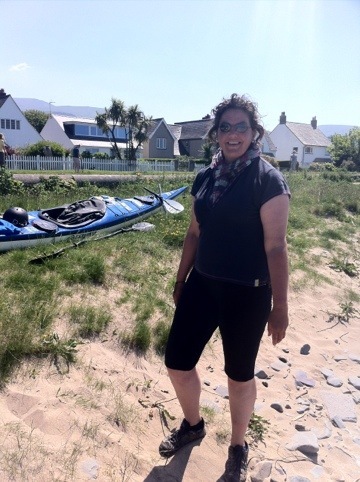 She and her partner Roger Chandler run bespoke sea kayak expeditions from their base in North Wales. Sonja was so friendly and even offered us her place to camp down in. We were getting up at ‘sparrows’ to catch the tide this morning and get round Orme’s Head so decided to bivvy down where we were. But hope to catch up with her and Roger perhaps on one of their courses some time. Anyway, my obsession for checking the inshore weather on the Met Office website paid off last night when I noticed at 11pm that the strong wind warning had been dropped. 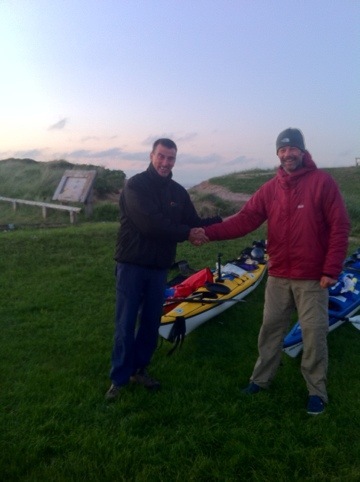 We were up at 4am and paddling towards Great Orme’s Head by 4.50am. Whilst there was still a fairly stiff headwind the sea state was slight and we made reasonable progress and 2.5 hours later we were enjoying the sounds of the razor bills up on the cliffs. We’ve just pulled into Llandudno for a decent coffee and breakfast – yummy. Aiming for Towyn or Prestatyn today depending on those winds. And just as I write this Barry Shaw has been in touch with Mike to give us some camping tips for the next few days. Sonja had apparently asked Barry for some ideas for us. How helpful is that!! Such friendly people. Well another windy day preventing is from getting round Great Orme’s Head but should be back on the water Sunday and winds permitting across the Solway Firth by Friday. Tanya coming to see us again today as is Geoff’s daughter Liz. So lovely way to spend a day off the water. Over the last four days we’ve clocked up 133 miles and so a bit of a boost to our daily average – which now stands at 22.5 if you only count paddling days, or 18.5 if you count the bad weather days too. Yesterday we paddled into the Menai Straits, a name that conjures up scary images for sailors but for kayakers less so. Having said that we did manage to take longer to get here than anticipated and so with fading light we picked our way through the races and breaking surf over the sandbanks before being whisked up to 7 or 8mph (Jenson Button eat your heart out). The next challenge before the light left us completely was to punch our way through the stream up an inlet to our accommodation for the night at Penrhyn Bach. 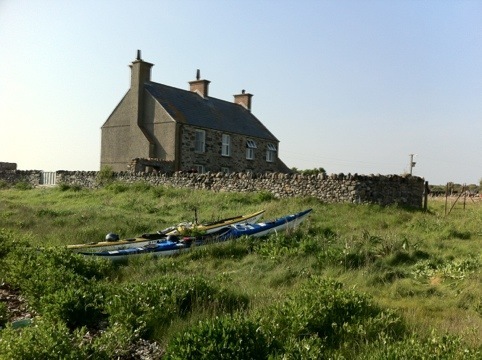 A beautiful house belonging to some friends, Alex and Susie, who very generously offered to us to use to recharge our batteries and wash and dry clothes and kit. Thank you so much!! We felt a little guilty taking a day off today but after 3 weeks paddling it was time to get everything washed!! We’ll be up early with the flood tide tomorrow and jumping on the fast conveyor belt up the Menai Straits to Great Ormes Head and on to Rhyl. Around 40 miles or so. And really looking forward to tomorrow night as Tanya and her parents, Roger and Ivy are coming to meet up with us. And of course George will be there too. and, as mentioned elsewhere, was always due to leave the party early. friends’ wedding made the most appropriate moment to make the move. For our part, we miss Mike badly. His awful jokes and military stories helped while away many a paddling hour. I now have to put up with Geoff’s ‘when I was a firefighter’ stories and he has to put up with mine about consulting assignments – and you can imagine how dull some of those are! Enjoy the rest of the sabbatical Mike and come and see us in another part of the coast! Geoff and Andy are currently enjoying killing time at the Ty Coch Inn in Porth Dinllaen. We enjoyed a big boost from the morning tide out of Aberdaron and through Bardsey Sound and pulled in just as it started to turn against us after 18 miles or so. 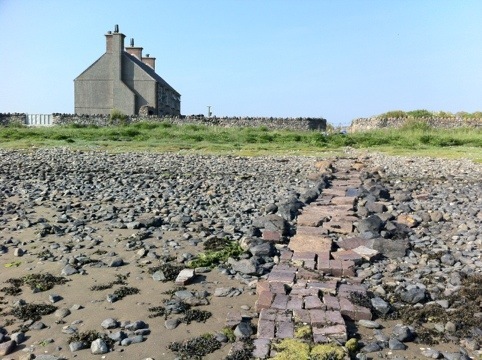 We’ll jump back in the stream again after 6pm this evening and paddle another 18 miles up to Anglesey where we have the pleasure of a cottage for the night courtesy of Alex and Susie. Thank you so much guys!! 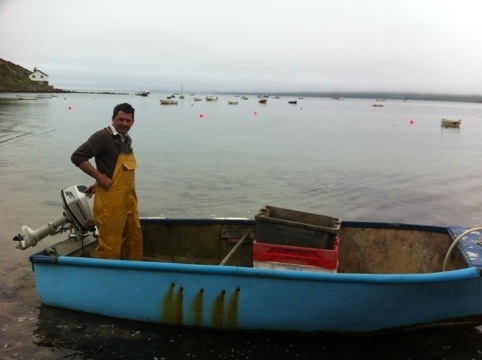 When we arrived in Porth Dinllaen this morning we met Dave who was busy putting out lobster pots. He gave us some tips on the streams and incredibly generously gave me a lift into the nearby town to collect some groceries (he even waited and dropped me back again after). Another wonderful example of kindness shown to us on this little adventure of ours.